Reducing food waste often means keeping track of the expiration dates of the many perishable items sitting in your fridge. Smarterware, a new line of smart food storage containers from Ovie, is designed to eliminate this hassle. The containers keep track of your food's lifespan and clearly signal when groceries have passed the point of no return, as designboom reports. The Smarterware line, which Ovie debuted at CES last year, works using SmartTags that track how long food has been in your fridge. These small trackers fit into the lids of Ovie's containers. They can also be attached to generic storage containers or food packaging using the Ovie Connect, a circular holster you can stick anywhere, or the Ovie Clip. The kit also includes a hub that allows the SmartTags to connect to the mobile app or a smart home system like Alexa or Google Home. 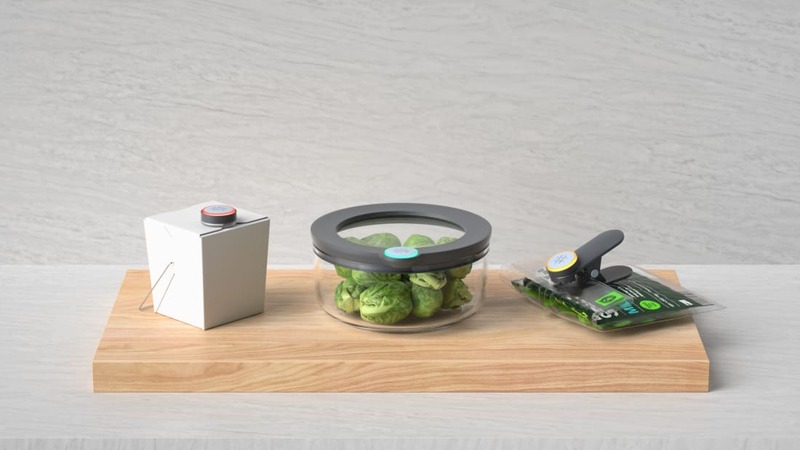 All you have to do to track your food is seal it in the Smarterware, slip one of the SmartTags onto the lid (or attach the Ovie Connect or Clip to other food packaging), and press the SmartTag. You'll be able to use the Ovie mobile app or your smart home assistant to record what food you're saving. The system can then estimate how long the item will last, based on Ovie's database of typical food spoilage times, and begin its countdown to the expiration date. As time goes on, the colored ring of the SmartTag will change to alert you to the food's condition. When the ring around the SmartTag is lit up green, the food is safe to eat. Yellow indicates that the food is approaching its expiration date, and red means it's likely spoiled. Smarterware's technology makes it so you don't even need to peek inside your fridge to see what food is OK to eat. Ovie will send a notification to your phone when an item is about to go bad. In addition to working with home assistants like Amazon's Alexa, the smart storage system integrates with recipe apps and grocery apps, so if you aren't sure what to make with the produce in your fridge, it can suggest recipes for you. On average, most Americans end up throwing away an estimated 20 percent of the groceries they buy annually, costing the average family of four approximately $1500 a year. If that statistic applies to you, the Smarterware starter kit's $130 price tag could quickly pay for itself. After raising nearly $65,000 on Kickstarter last year, Ovie is preparing to ship out the first Smarterware products in spring of 2019. You can preorder yours today at Ovie's website.